Skis & Poles & Bag. Great Skis & Poles with carry bag. Dynastar junior skis. 130 cm with Look bindings. Women dynastar skis - Exclusive idyll 164cm. Condition is Used but no significant damage to base or edges. Dynastar Kids Skis 130cm. Condition is Used. Great skis, two of our kids have used them over the past few seasons but they are now too small, still plenty of life left in them. Dynastar Freestyle twin tips 155cm Bindings Included Freshly serviced by The Piste Office Never had a base grind! SKIS Carving /All Mountain-DYNASTAR ACTIVE EASY-163cm- GOOD LADIES SKIS! SKIS Carving /All Mountain-DYNASTAR ACTIVE EASY-163cm- GOOD LADIES SKIS!. Condition is Used. Collection in person only. Dynastar Mythic 97 touring skis 177cm, excellent condition. Photos are of the actual skis for sale. Skis have been used only on one ski trip. Edges are in perfect condition. Base is near perfect, has had one scratch which did not reach the edge or the core of the ski. A great parting drink before heading to the airport for your annual ski trip! The shot glasses are held on to the ski by good magnets, which makes for easy removal and cleaning! Dynastar SkiCross 9 (170cm) & Look NX 11 bindings - massively reduced to clear ! Dynastar SkiCross 09 & Look NX11 Bindings - hardly used. Length 170cm. Look NX 11 bindings. Grab yourself a bargain by getting a great ski with bindings, all ready to go for just £109. The edge has been broken and repaired, as shown in picture. 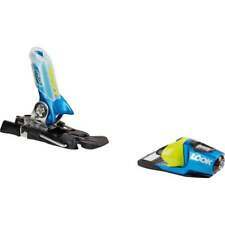 Bindings are adjustable and can be fixed or floating. Terrific condition, sharp, waxed, ready to go. Look Axial bindings fully functioning Din 3.5 - 12, if you’re collecting I can set up the binding to fit your boots. Used but certainly not abused, they have loads of edge material on them so still good for many seasons. Dynastar Skis 148cm NEW. Condition is New. Dispatched with Other Courier (3 to 5 days). Dynastar Skis like new only used once and in immaculate condition. 120 ono. Dynastar big trouble 186cm long. 120cm DYNASTAR STARLETT GIRLS Skis. 120CM SKIS. RSP WHEN NEW SKIS & BINDINGS £200 . NEVICA GIRLS SKI POLES WORTH 20 QUID. COMPLETE WITH NEW. New listingDynastar skis MAX Zero Composite core 190cm 1.9m Stacks Rossignol bindings. Cham Dynastar Mens Skis 184cm. Condition is Used. Comes with binding. Collection only. Any questions please ask. GENUINE DYNASTAR GREY SKI CAP, ONE SIZE FITS ALL. Here we have a Dynastar ski cap in grey brushed cotton, streamlined style. Dynastar logo on front and side. Embroidered with silver reflective thread along front peak and seams. FS: Dynastar Cham 87 High Mountain 178 and Dynastar Pomoca Skins £175. Condition is Used. The Cham design is a modern classic based on its large spatula (Dynastar call it their Levitation Profile). This High Mountain touring version is 87mm underfoot, has a radius of 16m and weighs 1660g each ski. One pair of blue and white Dynastar Driver X10 160cm skis, suitable for a smal l person. GENUINE DYNASTAR BLACK STRETCH SKI CAP, ONE SIZE FITS ALL. Here we have a Dynastar ski cap in soft black nylon with a black net effect rear half in stretch polyester. Size: One size fits all with elastic headband. Dynastar Ceramic Easyturn Skis. Omega VHP 995. Tyrolia 540 Bindings. Isospeed base micron finish. ~173cm long. In good condition. Comes with Volkl Bag thrown in as it has writing on as seen in photos. Please see my other ski items for sale. Collection only from Amersham. Dynastar exclusive legend powder ski 172cm. 85mm underfoot good all mountain Ladies ski. In used condition. There is a repair to the back of one ski in epoxy where the tip protector was broken off and fixed with epoxy. MODEL NR DA7VA11 RADIUS M. 16 SIDECUTS MM. Dynastar Driver Cruise Skis MADE IN FRANCE. SIZE CM 172. BINDINGS ARE MISSING. Skis have been freshly waxed and sharpened edges. With Salomon S711 bindings. These skis will perform but as ever these and any used skis would benefit from a general service. DYNASTAR's "Legend" range is a new take on aclassic style. Within this all-mountain collection, theLEGEND W 80 is aversatile ski specially designed forfemale morphology with alarge balanced sweet spot, lightweight construction and reworked profile. Dynastar legend sultan 184cm long, fluid bindings. Dynastar children's skis. Side Cut 107.67.94. Junior slalom ski racing bindings. Condition is Used. Collection in person only. Skis are perfectly functional, including bindings. Usual wear and tear that you would expect. Bottom could do with a wax but can be used straight away without any issue. This saves weight and makes the ski very easy to handle, as well as being resistant to chipping. Active Wood Core - A wood and Microcell core gives the ski great shock absorption and a smooth ride quality. The RRP with SPX binding £585.00. Bindings:Xpress 11. Bindings - Included - Look Xpress 11. 40% Off SAVE £149.98. This saves weight and makes the ski very easy to handle, as well as being resistant to chipping. Do a Google search for"Absolute-Snow" to find out more. Dynastar Skis. Omega 5 T.182. Carbon Polyglass Kevlar. Tyrolia 540 Bindings. Isosint base micron finish. In very good used condition. Ski bag and ski boots available in separate listings. Collection only from Amersham. A real freeride ski! From the junior skier to the future pro Dynastar LEGEND TEAM has everything to fill those who do not want to be content to follow the trace of their parents! The right width to pass in all snow ( 76 mm in skate ) junior flex and double rockers specific for maximum agility.